Payroll is often one of the most low profile functions within an organisation, but it is essentially one of the most critical business processes. It has a big impact in keeping a business’ most valuable assets happy – its’ employees. An organisation’s employees need to feel assured that they will be paid on time and the correct amount. If any deviation occurs, it may compromise the organisation’s work climate, resulting in under-performance and a lack of trust from its employees. Handling payroll in one country is a manageable process but becomes complex when a business begins to expand into new countries and regions. If a scalable global payroll management process is not set in place, it can cause complications for the management of payroll in-house and with external payroll providers. Internal payroll, HR and Finance departments can begin to receive an influx of information and status updates for each country and region which needs to be manually aggregated in-house, causing an excess of work for each department during each payroll cycle. If not already in place, organisations need to create a global payroll system, consciously designed, on the basis of a structured and dependable in-depth business plan with inbuilt flexibility for expansion into new countries and regions. By delivering a global process that has scalability by design, the global payroll function, whether sitting in HR or Finance, will be an active partner to the business in global expansion and enabled earlier goto market by faster implementation. Taking this into consideration, we have mapped out the key areas in which HR, Finance and Payroll functions within the business need to develop and understand when scaling the Global Payroll Management Process. Sales and Marketing seeking Foreign Direct Investment (FDI). Regulatory requirements which require people to be based in the businesses current markets. These drivers cause a growth into new countries and growth in the type or number of employees within a multinational business. In turn, these drivers have an impact on the global payroll system. In recent years the drivers of scalability have changed and increased with the globalization and digitization of multinationals. It is becoming easier to become a multinational with lower investment costs. “Estimates show that at the end of the 1960s there were roughly 7,000 multinationals operating worldwide, while almost 80,000 active MNC’s were counted in 2006. ” Harvard Business Review, 2016. “Global M&A this year crossed the $1tn mark…, the fastest it has ever reached that level, as a wave of consolidation spreads across the US and activity in the UK, China, Germany and Japan accelerates.” Financial Times, 2018. Now more than ever, there are far more multi-nationals being set up, fueled, in the vast majority, by mergers and acquisitions. “Global FDI fell by 23% in 2017, but that was largely due to a 22% fall in M&A activity. But global flows of money (bank loans and other investments) grew in 2017.” United Nations Conference on Trade and Development report 2018. Knowledge Seeking FDI – Multinationals acquiring companies as they already have an IP built out or skills and structures already in place to manage them. Traditional Business Digitization Investment in which traditional business are drive investment abroad. Based on one country, the most common payroll system is an operational process which has inputs, reviews to ensure payroll has been processed correctly. 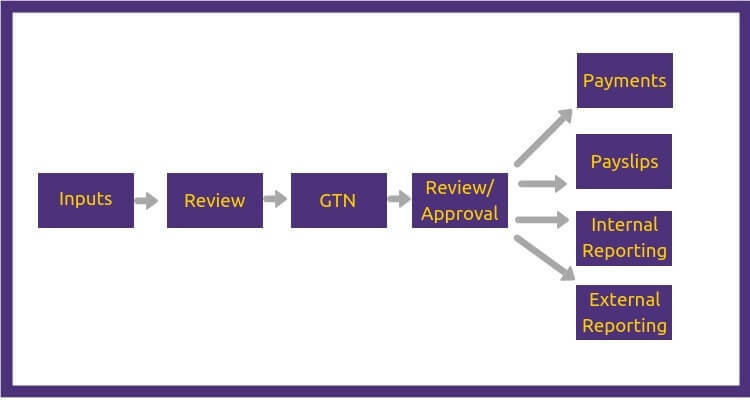 It then goes to the payroll provider for the Gross To Net (GTN), it returns to the payroll or finance department to be reviewed and approved. The payroll then feeds off into different directions including, payments, payslip distribution, internal reporting and external reporting. The process may seem simple and straightforward on paper but there are a strong number of internal and external cross-functional deliveries and dependencies throughout the entire process. There is strong interdependence between all functions within HR, Finance, Payroll departments and their external payroll providers, but there may be only a small number of people within the company that are exclusive to payroll. The Central Payroll Team. The inter-dependency between teams is one of the biggest challenges in Global Payroll Scalability as the central payroll team are the only business function whose KPIs are dependent on the completion of the payroll process. The HR, Finance and payroll providers have other projects and operational process to complete in addition to their part in the payroll process and it is not viewed as the key KPI on performance throughout their day. In essence, there is a very fine balance between payroll and the stakeholders involved to lock in a delivery process that they will stand over and meet so the central payroll team are not exposed. At Payslip, we hear global payroll stories daily. We understand the difficulties in designing an automated delivery process that consolidates payroll from multiple internal departments and external payroll providers on time and in the correct amount. Learn how we can help you consolidate and automate your global payroll processes here. At the end of the payroll process, there is also a large exposure and dependencies on external providers. Payments need to be made, Payslips need to be distributed and fed through HCM or Employee Self Service (ESS) System. Payroll needs to be internally reported on for General Ledger (GL) and externally, payroll needs to be sent to tax agencies, social security administration and benefits providers. When we are looking at global payroll in a single country, we have this entire environment to work through. When more countries are added to the payroll process the risk factors increase if there isn’t a tight control over the processes. 1. High level of operational dependencies. 2. High level of exposure in the event of a mistake or deadline – this can impact stakeholders, company employees, finance department and the external tax authorities. 3. Unplanned scaling or short timelines which impose urgency on strategic setup for future operational deliver in a new country context. 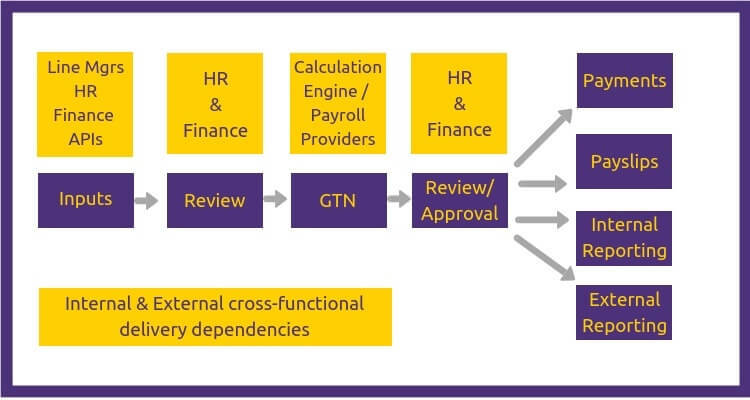 To enable scaling in a managed sense, especially in the context of short or unplanned scaling, the Global Payroll System needs to be designed consciously with a centrally designed core global payroll management process. This system needs to be separate from any in-country payroll processing or compliance processes. Discover how Payslip can help you create an automated Global Payroll process with consolidated reporting. Multinationals in-country processes need to align with a global process. The global process and policies on payroll provider selection, engagement, process management, data exchange and protection need to dictate the in-country management processes. In-country processes need to align with a global process and the global process and policies need to dictate the in-country management processes. To have a completely scalable system it needs to be planned centrally and adapted as a playbook once the country comes to scale. The Global Payroll System needs to be designed with capacity and redundancy built in for new market setup, operational setup and the operational processes to map into the global processes. What is the financial year and business cycle? When do we want to pay people – monthly / bi-weekly etc? Where do we want governance to sit? What mix do we need centrally / decentrally? For the process we design, what internal resources do we need? How many input/review steps do we want? What level of resource will have rights/responsibilities? What supervision does each level need? How do we track what work is complete/due? We have mapped out the key areas in which HR, Finance and Payroll Departments need to develop and understand when scaling the Global Payroll Management Process.